Get affordable Security Camera installation on Torrence, CA and CCTV equipment with commercial quality and 2 years warranty. Protection4less install 2 technologies in security cameras TVI and IP. Upgrading your old standard definition system to HD-TVI is easy with small cost. TVI uses the same wiring as old analog systems. The transmission of the signal of TVI security camera systems is more than 1000 feet. This makes this TVI system practical to installations on big facilities. The cost of installing TVI security camera system will be less than the cost of installing IP security camera system. TVI system uses the same connectors and power as old analog systems. There are 2 different voltages that can power old analog systems and new TVI: 12 VCD and 24 VCA. For a short range of distances between the DVR and the cameras, 12 VCD can be used. On distances bigger than 1000 feet 24 VAC will be the best with a regular Siamese camera wire. The Amps of the power supply can be calculated from the specifications of each camera. From example in we have 16 cameras and the consumption of each camera is .5 Amps, the total power required will be about 8 amps (16 x .5). The total Amps of the power supply has to be 30 % greater than the consumption (.3 x 8 = 2.4 amps). With a 10 amp power supply we can power all the security cameras with no problems. 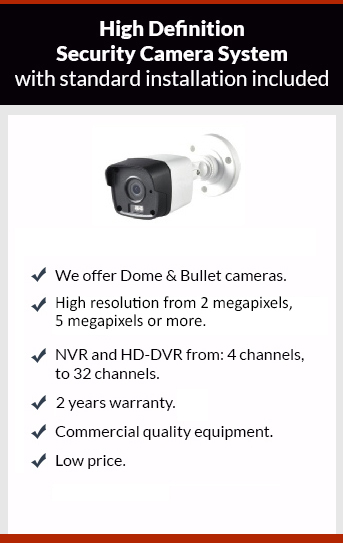 Protection for less installs commercial quality CCTV security cameras with the best components in the market. Give us a call we’ll give you the right system at the right price for you. The estimates are free.